Doosan Portable Power makes protean equipment. Its portable power portfolio includes versatile machinery — compressors, light towers, power generation and compaction equipment — all of which can find varied work in markets ranging from utility and road construction to oil and gas and standby power operations. In fact, Doosan Portable Power equipment is especially popular in both rental and event applications, helping light and power important projects on big stages. In early October, Doosan Portable Power was helping brighten just such a big event — the Bank of America 500 NASCAR race at the Charlotte Motor Speedway — providing light and power generation around the race track, in-field and camp grounds. The company was also celebrating. Along with more than 200 dealers and customers, Doosan Portable Power invited Compact Equipment down to Charlotte to enjoy the race, meet its personnel and learn about its growing range of products; the company’s home base is in Statesville, N.C., right up the road. We took the opportunity to sit down with Rus Warner, manager of global air products, to discuss the rich history and bright future of Doosan Portable Power. We learned about everything from rammer technology to racing sponsorships and saw firsthand how the company’s products help power important projects. CE: Rus, first off, thanks for taking the time. We know you’re a busy man with a big product portfolio, so thanks for sitting down with us. Considering Doosan Portable Power’s big product lineup — being experts in power generation, light towers, compressors and compaction equipment — which unit has you the most excited these days? Warner: It’s hard to pick favorites. It feels like each product is going through major evolutions to drive customer productivity in different ways. Generators are the most revolutionary right now, with planned expansion into alternate fuels while continuing our path on diesel emission compliant technology. The light tower market is in the middle of LED technology development that will eventually drive down the fixture cost with satisfactory quality light. This technology has been talked about for years but has historically been cost prohibitive. Air compressors are our most solid and steady product line, but Doosan Portable Power will be bringing a lot of innovation to the product over the next two years driving customer productivity and operating cost reductions. During the emission development, Doosan Portable Power introduced many innovations like the variable speed fan clutch in our P425/HP375, including 10 percent decrease in fuel consumption, service diagnostic control panels featuring multiple languages and maintaining prior tier package footprint. CE: We’re at the Bank of America 500 NASCAR race in Charlotte, N.C. Doosan Infracore Portable Power is right up the road in Statesville, N.C. Doosan Infracore has been an official sponsor of Joe Gibbs Racing since October 1988, with Doosan Portable Power joining the support for the team in 2009. What is it about NASCAR, Joe Gibbs and high-performance racing that gels with Doosan Portable Power? Warner: Doosan is proud to be partnered with Joe Gibbs Racing but not for just the obvious reasons — two teams in the 2013 Race for the Chase with 111 wins in the Cup Series since entering the series in 1992. The Joe Gibbs organization is based on strong core values and a passion for success. Those same attributes are the core at Doosan Portable Power. Joe Gibbs Racing has one of the highest employee retention rates in motorsports because the organization cares about the personal development of the employee while striving for success on the track. Doosan is on the same path with our 2G philosophy of growth in people results in growth in business in a continuous cycle. CE: Doosan Portable Power is obviously a newer name for this company and its products. A lot of folks still recall the rich history of Ingersoll Rand products. How difficult was that transition and where do you feel you are today with it? Warner: Transformation complete! 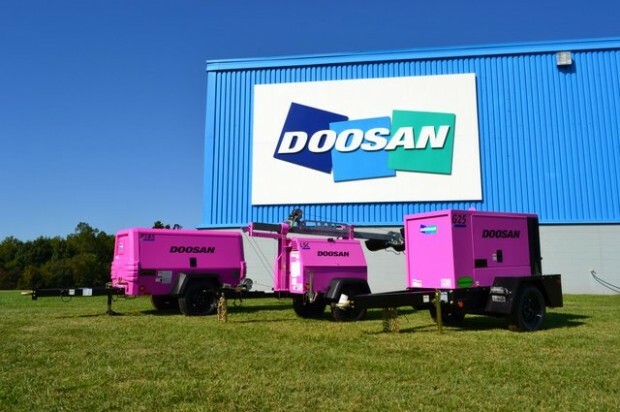 Doosan Portable Power is a vibrant brand with a renewed passion for customer success. The brand change was much more than a logo change; we used it as an opportunity to create a new culture focused on customer productivity, customer satisfaction and a drive to be the best at our core businesses. The Americas, Europe and Africa transformation was relativity easy, but we faced larger challenges in Asia and India. All over the world, the customer feedback proved that we have become stronger in our core businesses, and our passion for customer success is contagious to our employees, dealers and customers. Just like at this tailgate event with over 200 dealers and customers from every channel we serve, relationships are still the currency of success in our market. It is still people that make things happen. CE: First off, how much of your time has been spent on Tier emission debates and updates over the last few years. Is there any way to even quantify that? How difficult of a process was adapting your machines to these EPA-mandated regulations and all of these new engine technologies? Also, what technologies is Doosan Portable Power embracing for Tier 4? SCR, EGR, DPF — pick some acronyms please. Warner: Doosan Portable Power is proud of our accomplishments in having an emission compliant portfolio to sell, but it has consumed a significant portion of our engineering spend over the past five years. The technology has been challenging, but a larger challenge has been getting production-like hardware early enough to put it through the rigorous testing that Doosan Portable Power employs. The commercial impact has not been technology; it is the cost of that technology. Launching 13 new Tier-compliant models in 2012 with higher prices has resulted in changes to the market and business models for operating and owning a fleet. Since all of Doosan Portable Power products are autonomous equipment, the impact of engine cost change has had a higher impact to the total price of the package. In Tier 4i Doosan is embracing DOC only up to 175 hp products and DOC/DPF for 200 to 600 hp. As we move forward into Tier 4 Final, DOC only up to 100 hp and DOC and SCR for above 100 hp. CE: Who OEMs your engines throughout your lines today? Maybe we could name a few brands and why you like’em. Warner: Doosan Portable Power uses seven different engine brands around the world. Cummins, Deutz and Kubota are our primary brands. Kubota is a great brand with reliability and strong service network globally. Deutz is a technology leader with DOC-only emissions after-treatment on less-than-100-hp engines. Cummins Industrial Engines has best-in-class technology and strong partnership on emission compliant products. CE: It was maybe in 2010 when you released the LSC light tower (LightSource Compact). I always thought that was such a great product — very portable and powerful. How has that series fared? Also, what cool new lighting ideas or technologies are on your minds these days? Have balloon lights ever taken off? Warner: We’ve had strong sales for the LSC with significant market share capture in the past 18 months. It was very well accepted in the rental market especially, which it was specifically designed for. Balloon lights have grown with some key applications for glare-free lighting in oil and gas along with the rise of use in road construction. CE: What advice would you give a customer when buying or renting a portable generator? What is the best way for a professional to match applications and wattage requirements when buying a gen set? Warner: No. 1: Rent and buy generators from a knowledgeable dealer or rental house. They are the experts that can help you understand the true need of the application and size the right generator. From the Doosan Portable Power perspective, understanding the loads and timing of the current required are key to right-sizing the generator. We offer our entire line with AREP technology providing extra excitation coils in the alternator for motor starting. With a little planning, a smaller generator can be used based on the base load of the application and the AREP can handle timed spikes without a drop in frequency. CE: Rammers today are evaluated on a variety of different specifications — impact force, frequency, weight and stroke. Unfortunately, some of these specs can be hard to understand and pin down. Take impact force for example, which is one of the most popular and most difficult specifications to qualify for rammers. Customers are looking for a number — how hard does the machine hit? How should they go about determining that? Warner: Doosan has three models to address this customer need: RX264, 304, 344 — 2,600 ft-lbs, 3,000 ft-lbs and 3,400 ft-lbs of impact force. The soil type and moisture content really dictates which rammer is appropriate for an application. The “lift” or height of the backfill must also be considered. Lots of people want it to “hit hard,” but the reality is to compact appropriately needs the right product for the material being compacted. Hitting harder doesn’t always compact more, especially in high void soils [rocky or sandy soils]. Putting too much energy into the soil can also have negative effects and destabilize the soil. CE: Air compressors had a long tradition at Ingersoll Rand. I’ve seen great old photos of those famous compressors being used on the Panama Canal and the Hoover Dam. What about today? Are there any cool stories and interesting applications that you can share? Warner: There are interesting applications happening everyday with our products. You mention the Hoover Dam. We also helped build the new Hoover Dam Bypass bridge 85 years later which opened in 2010. Doosan Portable Power provides the portable air on waterwell drills in India to supply clean water to remote populations. Powering the Grand Tourer Race in Belgium with 40 generators was a highlighted application in July. We are all over the globe providing power, air and lights behind the scenes. CE: Now that Tier 4 Final is approaching an end, the Doosan Portable Power crew can probably concentrate more time and money toward their core competencies. Looking into your Magic 8 Ball, what industries, applications and equipment types do you feel might be a possible big focus? Warner: Doosan Portable Power is excited to spend more resources on developing even more innovations and customer productivity improvements. During CONEXPO-CON/AGG 2011, we launched the new VP900e variable speed electric portable that has been well received in the market, and we will continue on the path of alternate energy power including gasoline, natural gas and electric. Many of the new products will save significant amount of fuel yet provide the power density that customers expect from these products. The compressor line was able to maintain package footprint through the emission transitions through innovation. We will continue to develop ways to lower operating cost with superior reliability and durability.